This article from The New York Times is from May 1982…nearly 35 years ago. Today, the majestic structure of the (now) First Church of Christ, Scientist is a landmark protected as part of the Upper West Side/Central Park West Historic District (designated in 1990). Embracing its stewardship role, the congregation undertook an extraordinary, award-winning restoration of the church completed in 2009. Back in 1982, when the Related Companies planned to build a high-rise apartment building on the church site, preserving any building, no matter how beautiful or historically significant, on the Upper West Side was far from a sure thing. Only a handful of sites between West 59th and 110th Streets, Central Park and Riverside Park, had been officially designated as city landmarks (compared to over 3,500 today). The resplendent All Angels’ Church on West End Avenue and West 81st Street had been demolished a few years earlier. Mount Neboh Synagogue on West 79th Street would be destroyed a few months later. The landmark St. Bartholomew’s Episcopal Church on Park Avenue planned to build a 59-story apartment tower on its site, a signal of the intense development climate throughout New York City. LW! has special reason to celebrate the saving of the (now) First Church of Christ, Scientist. 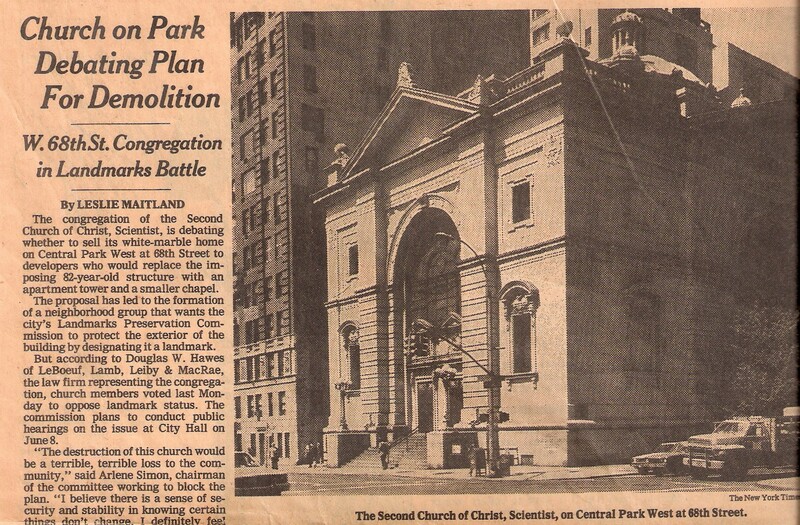 Our founder, Arlene Simon, rallied neighbors from 68th Street and beyond to form The Committee to Landmark the Second Church of Christ, Scientist. The Committee pressed the New York City Landmarks Preservation Commission (LPC) to hold public hearings to consider the building for Individual Landmark status (and then chartered buses to bring community members downtown to testify). Vigilance and activism kept the LPC’s feet to the fire until it announced, in 1985, “the start of a systematic approach to examine the historic fabric of the Upper West Side.” This study resulted in a series of significant designations (the San Remo, the Belleclaire, the first Riverside-West End Historic District and many more), culminating with the creation of the Upper West Side/Central Park West Historic District—one of the largest historic districts ever designated in New York City, with over 2,000 buildings, including the (now) First Church of Christ, Scientist. For more information on the history and design of this building and others, please explore our online database of Upper West Side landmarks. The congregation of the First Church of Christ, Scientist, the Individual Landmark designed by architects Carrère & Hastings and completed in 1903 at Central Park West and 96th Street, merged with the congregation of the Second Church of Christ, Scientist, at Central Park West and 68th Street, in 2003. The sale of the 96th Street church to the Crenshaw Christian Center yielded funds to support the restoration of the 68th Street church. The altar of All Angels’ is now part of the Metropolitan Museum of Art collection, exhibited in the grand American Wing courtyard.